22.00 pm. Pre-party with DJ Osval in hotel San Juan with all Cuban dance partners. Animations by the Cuban dance teachers. 14.00- City tour Santiago de Cuba can be booked (optional): Make a fantastic city tour with a professional guide through the old town of Santiago de Cuba. You will visit several important buildings, squares and dancing locations. 16:00-18.15 Dance workshops in 4 rooms (see workshop schedule). 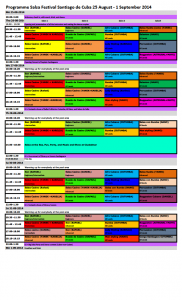 16.00-17.15 Workshops in 4 saloons (see workshop schedule). 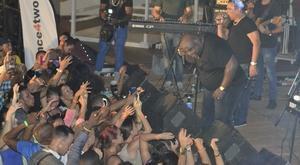 20.00 -20.30 Big Rueda de Casino with all participants and Cuban dance partners at Parque Cespedes in Santiago de Cuba. Visiting the beach of Siboney (optional). 16:00-18.15 Workshops in 4 saloons (see workshop schedule). 10.30-12.45 Workshops in 4 Saloons (see workshop schedule). 22.00-..... Big Salsa farewell party with shows and surprises. Bye bye with live music in the hotel garden. You will meet with one of Havana's greatest salsa locations: Casa de la Musica, Hotel Florida, or maybe La Gruta. These locations are spacious with super music. 10.00 – 17.00 Classes, party, diner, and relaxing at El Porvenir, a natural swimming pool in the mountains. Free day and evening. We'll provide you with the best options to spend day and night. After checking in, the first introduction with Dance4two, the tour leader, the local organization, and all dance teachers and dance partners will start. You are offered a diner and drinks. For those without a jetlag and enough energy, there is the possibility of having the first impression with one of the finest salsa dance locations. 9.45. Briefing will take place about the programme, the dance lessons and professional Cuban dance partners. Salsa lessons will take 3 hours, including 1-2 small breaks. 10.00 - 13.00 Dance classes in 2 different saloons.. In room 1 there is one-to-one salsa dance classes, where everybody dances with his / her Cuban dance partner at his / her own dance level. In room 2 will be Son, Rumba, Afro, Rueda, Reggaeton, or Styling classes by Karelia Despaigne, and her team Tierra Kaliente. Lunch. You can have lunch in one of the numerous typical Cuban restaurants in the city (not included). 13.00 Lunch. For lunch are many beautiful spots: Restauramt Castropol at the Malecon, or have lunch in Obispo. El Floridita is a nice restaurant and was Hemingway’s favorite. It is a very elegant bar. You can also buy some food at the street. 15.00 - 17.30. Guided tour with a guide. 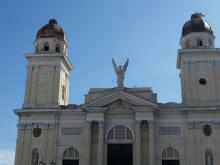 You will visit the beautiful old part of the city, the so-called “La Havana Vieja”. This 350 year old city has numerous beautiful spots. Walk around Calle Obispo and enjoy one of the several live music shows playing Cuban music. The guided tour will finish around 17.00-17.30. Rest of the evening is free to spend. In the evening you can go to Casa de la Musica. This place is the best places to enjoy the best salsa groups in Cuba every day. Different bands everyday/every week. Every day, bands like Alexander Abreu and Los Van Van, etc. are playing live. You will for sure enjoy a great evening dancing and having fun. 13.00 Lunch. For lunch are many beautiful spots. A nice street to have lunch is Obispo. El Floridita is a nice restaurant and was Hemingway’s favorite. It is a very elegant bar. We go with all Cuban dance teachers to Palacio de la Rumba. This former cinema is a fantastic place for a great party with all dance teachers. Free day. You can participate in one of the excursions (optional), such as: 1) to the botanic garden; 2) to the beach; 3) to Vinales with its beautiful nature, rocks and tobacco; 4) a tour in an old, beautiful American car, or 5) a bike tour. In the evenening we go with our dance partners to a fantastic salsa club: Grutas. 19.30. You can travel by taxi to one of the best salsa party’s in the city. Jardines 1830 is the headquarters of the Círculo de Fundadores del Casino - a group of people who were some of the founding members of the Casino style back in the 50's and beginning of the 60's. Nowadays it is a beautiful restaurant with a garden, where you can dance salsa with the Cuban people. 10.00 - 18.00. 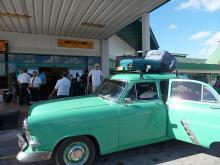 Around 10.00, you are picked up for the east of Havana, and after a 30 minutes trip, we reach tropical beaches Playa del Este. This beach is located in this area. You can relax and swim in the crystal‐clear waters for the rest of the day. Dance lessons at the beach with all Cuban dance teachers. The evening is again at leisure.